Those who know me, know that for the LONGEST time I’ve loved old stuff, especially mechanical in nature… cameras, sewing machines, radios, lanterns, but most of all, cars! For whatever reason, I’ve always had a fascination with the 1957 Chevy Bel Air. I’ve built models of it, have die cast versions of it – for no particular reason I guess other than I like how it looked. For my high school graduation, I was insured for 24 hours on a 1948 Ford Mainline. It was a friend of my fathers, and I was floored when he parked it in my parents garage for the week to let me polish it up and drool over it non stop! Forget the formality of graduation, I just wanted to stay behind the wheel! The date was July, 1993. 5 years later I took my first job. And a few years after that, bought my first house. 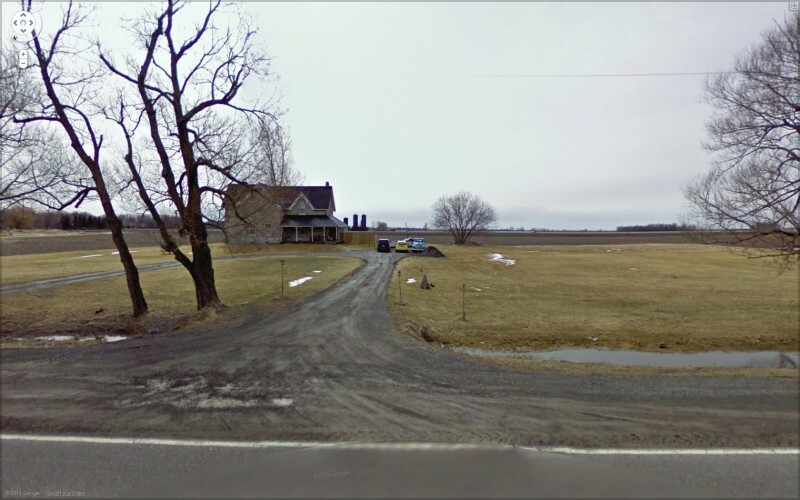 My daily commute would take me by an old farmhouse on Fallowfield Rd. 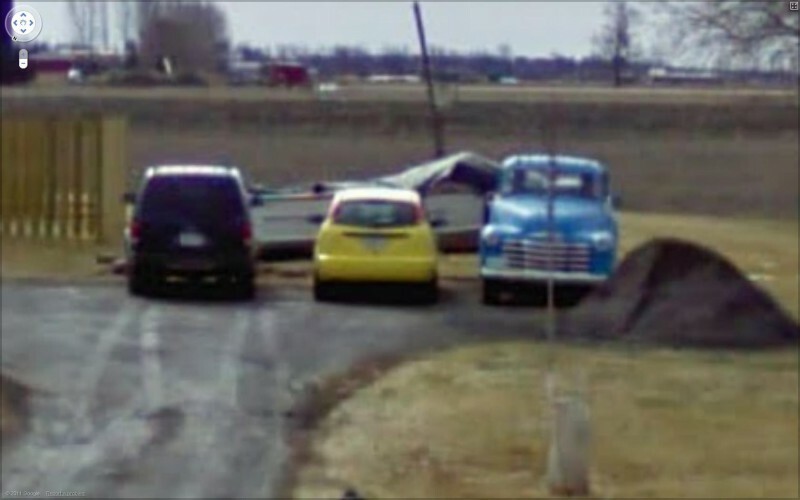 For about 9 years I drove by this house and saw the same blue truck parked along side one or two other vehicles. I always thought about stopping and checking it out, but I was usually in a rush to get to work, or too tired to stop on the way back! For 9 years total I drove by that truck 5 days a week. It ocasionally changed parking spots on the property, but it never left. 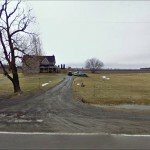 August 27th, 2010 – Heather (my wife) and I were heading to my parents for supper. Travelling along the same route that takes us by the blue truck. As we approached the property, the truck had been moved. It was parked up close to the main road! As we got closer, the red and white sign posted in the bed became visible! 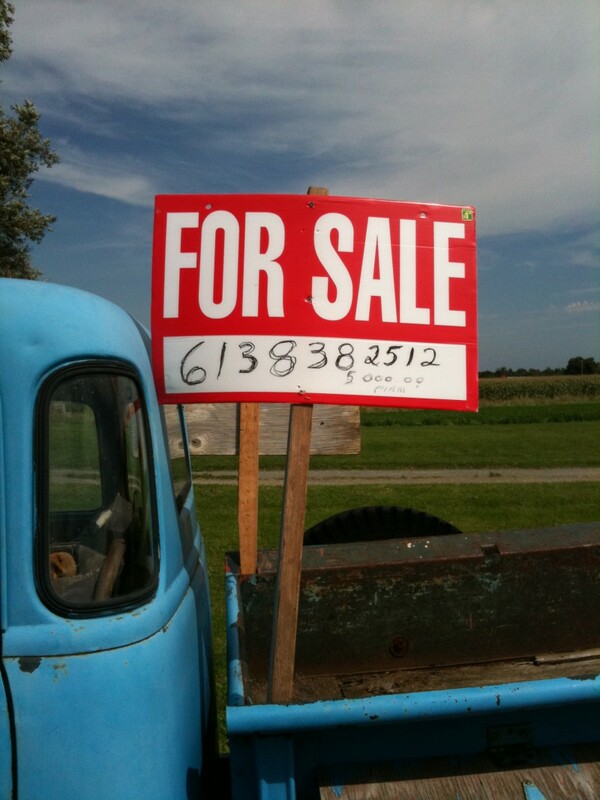 “FOR SALE”! Whatever we were talking about was instantly interrupted by thoughts of purchasing this truck! We were late for supper at my parents, so there was no time to stop and look. I still didn’t know what it was, or how much was being asked. All I knew was that I was going back in the morning to check it out. I secretly told myself that if the truck was $5000 or less, I would take it, the keyword being secretly, I’d have to get Heathers blessing first! August 28th, 2010 – That morning, I got up and asked the girls (my two oldest) if they would like to join me to go see the old truck. They were excited to go, and off we went! Shortly after we arrived we were greeted by the owners father. As we talked about the truck, I learned he was a retired firefighter – and he kept the girls entertained as I crawled all over the truck snapping photos like mad. 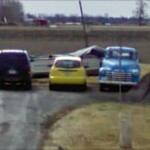 It was a 1949 Chevy 1434. Built in Oshawa, Ontario and shipped to Saskatchewan, Alberta to spend its life as a grain truck. It had a 216 (non original) but it ran. I was speechless when he showed me that it was a dump truck! The bed actually dumped! Spending its life in the prairies meant a very solid body and frame. No salt to rot it out. How it found its way back to Ontario is unknown, he had bought it 9 years previous in Gatineau, QC. I got to see the For Sale sign up close up. “$5000 – FIRM”. August 29th, 2010 – I returned on my own to meet with the owner. He wasn’t there the previous day. He described to me how he had planned to restore the truck to original for his dad, but due to life and other priorities, that just didn’t happen. It has sat in the yard for 9 years – it was time for it to go. After kicking the tires, and doing whatever research I could on the net, I made him an offer of $4000. He flat out rejected. He came back at $4500 – which I rejected! I offered $4250, but he wouldn’t budge. I ended up leaving empty handed, confident he would call me back offering to sell it for $4250 – I had given him my number. September 1st, 2010 – I couldn’t take it. I had all the “what if” conversations with Heather. I surfed as much Internet as I could trying to find comparable prices on trucks – any trucks I could find were usually cheaper, but also 100’s of kilometers away, requiring hefty shipping charges. This one was in my backyard! Only a 10 minute tow away! Heather must of been sick of my moping around, as she told me to just buy it! So I called up the seller, and got talking to his father again, and was very relieved to hear the truck hadn’t sold yet. I arranged to meet him (the owner) at 5pm later that day. We settled on $4,500, I handed him a certified check, and he handed me the keys! It had no functioning brakes (It’s 60 years old!) so it needed to be towed home. (not to mention its “UNFIT” status on the registration!) However, they did let me start it up and take it for a drive around the farm! Loved it! By 6pm, the flatbed arrived to take my new toy home! In an age where everything is disposable and plastic, one can really appreciate the time and effort it takes to keep a classic like this from the metal recycling pot. I always wanted to do something similar to a classic. I am not much of a truck person, I would like something a kin to an old rat rod. Not in the style of old and rusty, but more of the style … mat black paint, chopped roof or convertible and low to the ground. Best of luck with the truck! Thats exactly how I feel Wayne! As for plastic, there are only a small amount of it on the truck! The radio knobs and the heater knob as far as I can tell! I was never a “truck person” either -but once I saw it, I was converted. I have a couple of friends building rat rods. In a way its a bit easier – not having to keep the look too original and putting newer power plants in them. I think you should pick one up! Great hobby! 4500.00 is a steal, did you give him a tube of vaseline. You bought yourself a gem Mark. That was a heck of a buy, even down here that would be a deal. Each summer the fair grounds in Columbus, Ohio play host to the “Good Guys” car show/swap meet. Car guys will show up with there rusted out old cars/trucks asking two or three thousand or more. The surprising thing is , they sell. Good luck and have fun with your project. It was hard to price it – they’re rare around here, and if I was to find one cheaper farther away, I would have to pay to have it towed. So overall I was happy with the purchase. It’s given me a fair share of work, but FUN work! I love the fact that for nine years you drove by this vehicle with longings to own it. To think that it actually went for sale and that you got it…….well it’s like it was always meant to be !! It couldn’t have landed in better hands; you will restore it to it’s original glory days. I hope to get a ride in it someday. Tell me (and your fellow bloggers) did it come with resident pets ? Thanks! I feel the same way too! Great story Mark. I also loved the fact that you drove by the truck for 9 yrs. I would have stoped sooner . But patience paid of for you and the timing was right. Great buy and great truck. I also own a 49 five window, and she is family. I always thought of stopping, just to get a closer look – but I was always on the way to or from work – just seemed to always be in a hurry! It’s all in pieces now, and I miss going out to the garage to just start the old 216 for fun. It’ll be a long process, but well worth it. 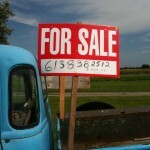 I too saw a ’49 one ton on the side of the road with a for sales sign. One night my wife asked if I noticed it. After dinner we drove over to have a look. I have had it now for 3 years. I had to build a shop to put it in and will start restoring it next winter. Mine has a grain box but no tilt. It is an original “Alberta” truck, has 40,000 miles on the broken speedometer. Congratulations! Please drop me a note when you get some photos online, I would love to see it!